Multicellular organisms undergo self-organisation during development. 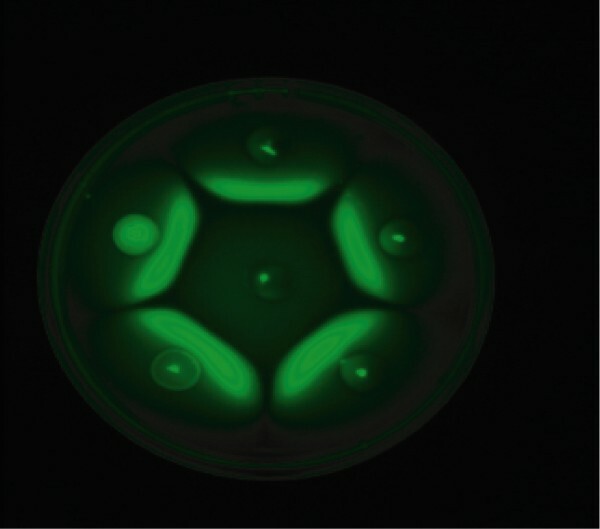 Our aim was to engineer self-organised pattern formation in free-swimming bacteria cells by providing an artificial system for bi-directional communication. E. coli cells would be equipped with genes derived from independent quorum sensing systems from P. aeruginosa and V. fischeri. These systems enable communication between cell populations and can enable regulated switching between competing cell fates. The negotiation of cell fates within bacterial populations can be visualized precisely by the expression of different fluorescent proteins. Using Escherichia coli as a model system we have observed how differential cell motility can, in itself, lead to pattern formation. Adapting the experiments of Weiss et al. 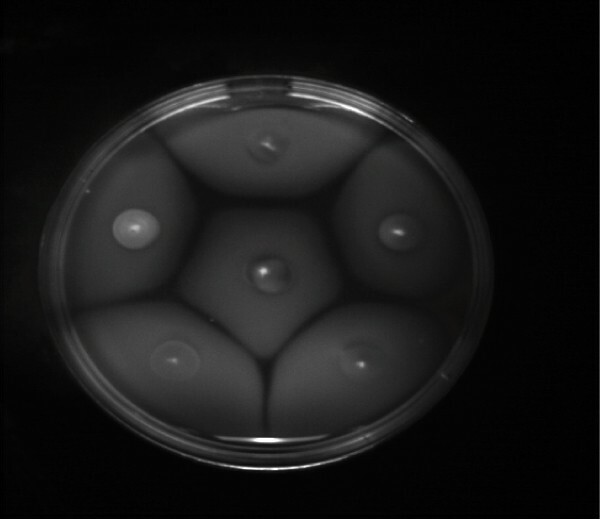 , we have studied the interactions between cell populations in swimming agar with genetically engineered sender and receiver cells. The sender cells express one of two acyl-homoserine lactone (AHL) synthases whereas the receiver cells are capable of responding to the generated AHL signal. Instead of using a differential response to AHL concentrations we employed cell motility as a way to define zones of response (see Figure 1 for an example). In particular we equipped highly motile strains such as E. coli MC1000 with AHL-mediated autoinducing systems based on Vibrio fischeri luxI/luxR  and Pseudomonas aeruginosa lasI/lasR  cassettes. We had these auto-inducing cassettes synthesized and tested them as depicted. To obtain an enhanced response the coding sequences were codon optimized. (See Figure 2).